Have you ever been humbled after being around someone else? Not intimidated by them. Not overwhelmed by their prowess or talent; but taken aback by their selflessness, humility, and dedication. That’s what I come away with after spending time with my best friend. I am humbled; thinking how all I think I do to bring God glory is not even a drop in the bucket compared to some. When I feel this way, I pray, and God reconciles me with His word. Let me take you through a typical day in my friend’s life. She often wakes up to the smell of coffee, the hum of an ATV in the distance, a donkey braying, or cattle lowing. With coffee or tea in hand, she settles in at her desk and breaks out several devotional books, with her Bible and journal front and center. She may turn on her computer to check news web sites or emailed prayer requests. For the next several hours, everyone in the household does their best to avoid her. She’s deep in study, reflection, and prayer. After a final prayer, she may have another cup; make something to eat—more brunch than breakfast—and settles into her day. Yes, she manages the household budget, makes the grocery lists, and directs the happenings throughout the home. 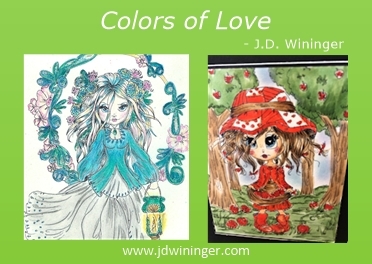 Mostly, she draws, stamps, paints, colors, and creates. She spends between eight and ten hours every day in her craft room/office spreading God’s love throughout her world. Coming to Christ in 2014, my friend took her immense gifts and talents for scrap booking, card-making, and a creative soul, and put them to work through a ministry she calls “You Matter.” This ministry—comprised of a few crafty friends―creates, personalizes, and sends cards of encouragement to residents of women’s shelters and transitional living facilities throughout northeast Texas. Not only do they make cards to encourage the women; they make cards for their children and many special birthday cards each month. Seven days a week, you’ll find my friend working on card designs, printing messages to place inside them, painting or coloring a design by hand, or addressing envelopes. Now you understand why I am humbled whenever I spend time with my best friend. How can I compare to that? With a sweet smile, my friend reminds me it isn’t how many we reach with God’s love; it’s that we reach out to others with His love and not our own selfish desires for recognition, self-satisfaction, or fame. We don’t do these things to showcase our talents, gifts, or skill. We share God’s love with others because He tells us to. God calls each Christian to be His representative in this fallen world. If some of you haven’t figured it out yet, my best friend is my wife, Diane. She is my inspiration for showing God’s love in my life. I pray each day I can come to love God, and show His love to others, like she does. I am humbled when I see how she colors her world with God’s love. “Hero” is among the most misused words in the English language. I can assure you, it is the best word I know to describe my wife. For all she’s faced and overcome in life; for all the ways she shows God’s love through her words and actions; for all the ways she gives love so freely, Diane Lynn Wininger is my hero and best friend. I love this expression of giftedness. Like the little drummer boy playing his drum for Jesus. If we could just grasp the simplicity of offering who we are to God. It blesses beyond measure. Amen Ms. Jeanne! It isn’t what we give as it is how we give it. Well said ma’am. God’s blessings. Your friend is giving away the fragrance of Jesus. No color or flower ever can match the aroma of the love of Jesus, which your friend gives so well. Thanks for this colorful example for us all and amen for your stand for Jesus. Thank you Mr. Terry. I suspect every man in the world can say this, but I am certain God blessed me mightily with Diane. I even wrote a poem about it many years ago. 🙂 When I am with her, I am the most blessed man on earth. What a sweet comment Ms. Melissa. Thank you so much ma’am. We sure can ma’am. You just shared your with Diane and me. God’s blessings. I love, love, love this. Hugs to you and Diane! Thus, you can see why I’m the luckiest fella in the world. Well, besides Mr. Russ. 🙂 God’s blessings sweet friend. What a beautiful tribute! And, what a blessing to be married to your best friend. I expect the feeling is mutual and that is also a loving gift from our loving God. It’s wonderful when we can see the best attributes in our friends and spouse. Often we look at the negative and miss the joy that God gives us every day. J.D.—You did it again! You made me get all teary. What a beautiful tribute to your amazing wife, Diane. She sounds like a special lady, indeed. God bless both of you for shining your lights brightly! Awww shucks Ms. Beckie. Just the result of starting to learn to listen my friend. God’s blessings. What a beautiful sentiment to a beautiful lady. As I began reading I wondered if you might be writing about your wife, and was delighted to come to the end and see— yes, you were. With the two of you searching God, walking in your callings, and blessing others with your giftings, your home must be an engaging and joy-filled refuge. Thank you for sharing about Diane. Thank you Ms. Connie. I’m pretty certain that as we get to know you and your family better (in God’s time), we’ll see many of these same “characteristics of Christ” in you ma’am. I pray our home is a refuge to all who enter. It certainly is for Diane and me. God’s blessings my friend. What a guy and a wife! I would love to meet the two of you. Maybe one day we will meet and sit and talk together. You sound like a great pair. God’s blessings on your marriage. What a sweet thing to say Ms. Stephanie. Thank you. If it be God’s will, Diane and I will get to meet you on this side of heaven one day. If not, then we’ll see you and your hubby in Glory! What a wonderful tribute to your wife! She sounds like an amazing servant of the Lord. I promised to make cards for a local ministry and have not done so. I pray I will make the cards with a heart like your wife’s. Thank you!! Thank you for these kind words Ms. Jeannie. I agree ma’am, Diane is an amazing servant of the Lord. I stand in awe of her selflessness and dedication. As to your card-making ma’am, the word you’re looking for is “Yet.” I have no doubt that you will fulfill your goal to bring God glory through the cards you’ll be making one day. It is just yet to happen, but I know it will. God’s blessings Ms. Jeannie.